A Daniel Vasilevski double has led Heidelberg United to an impressive 3-0 win over Pascoe Vale at Epping Stadium. Former A-League player and Young Socceroo Vasilevski broke the deadlock after a howler from Pascoe Vale goalkeeper Stefaan Sardelic, before a Kaine Sheppard header doubled the lead. Vasilevski completed the rout with 21 minutes to play. Heidelberg, looking to build on a third-placed finish last term, was without star striker Dan Heffernan due to an ankle problem. 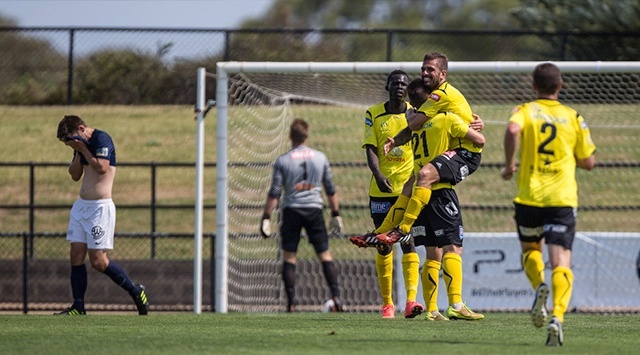 Heffernan bagged 18 goals for George Katsakis' side in 2014, but his injury paved the way for new signing Kenny Athiu to be involved from the start. Both sides begun fiercely at Epping - being used because Olympic Village was unavailable due to ground works - and Davey Van 't Schip was lively for Pascoe Vale, twice missing the target from good areas. Vasilevski's 22nd-minute opener came against the run of play, as Sardelic spilled a routine 25-yard effort that trickled over the line and in. Heidelberg turned the screw from there, quickly doubling the lead as Sheppard was on hand to nod in new signing Andreas Govas' cross from the right. Athiu was denied a first NPL Victoria goal for Heidelberg when Sardelic made a smart save to keep out his looping header. Shortly after Sardelic, trying to redeem himself, did well to tip over Reuben Way's fierce left-footed effort from distance. The oppressive heat appeared to impact both sides in the second half, with the free-flowing rhythm of the first absent. Kosta Kanakaris shot into the side-netting just before the hour-mark as Heidelberg went in search of a third, and it came when Vasilevski again found the net from distance to delight the majority of the 1221-strong crowd. This strike, also from outside the penalty area, took a wicked deflection that left Sardelic with little chance. Pascoe Vale's frustrating afternoon continued when a free header from Nathan Megic sailed wide in the dying stages as Heidelberg added a clean sheet to their excellent victory.